London's Mind Body Soul Experience has a new venue - Alexandra Palace. I'm really quite excited about this move. I've been going to the Mind Body Soul Experience for several years - since it began, I think. While I've always very much enjoyed going there, the venue in recent years has been Olympia, in West London, which was a bit bland and also noisy. In fact, I had heard a few great pagan teachers say they weren't going to return there to give talks or workshops because the general noise levels were intrusive. Hopefully this move will sort all those issues out. 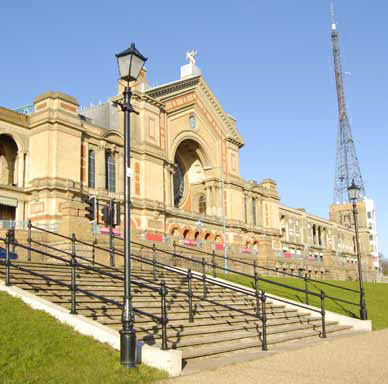 Alexandra Palace is a lovely north London venue, set in 196 acres of parkland and full of history and natural beauty. The interior is very nice as well. I think it is the perfect setting for a show that helps people balance hectic lives by developing a healthy mind, body and soul. The organisers say the new venue means the chance to introduce some new ideas, and the 2015 show will see the introduction of the Therapy Zone. This designated area of the exhibition will be full of experts offering one-to-one hands-on therapy including reiki, massage, acupuncture and reflexology. The Experience Zone offers workshops to get you up and moving and, as well as talks and readings, there is also marketplace of stands selling books, tarot cards, crystals, soaps, aromatherapy oils, jewellery, food, and much more. By the way don't get the Mind Body Soul Experience confused with the Mind Body Spirit events. I know the names are similar, but Mind Body Spirit is more focused on the New Age side of things, while the Mind Body Soul Experience has pagan and witchy stuff too. Tickets for the Mind Body Soul Experience ticket will also gain you free access into the OM Yoga Show, which is in an adjoining hall. The Mind Body Soul Experience is on 23, 24 and 25 October 2015 at Alexandra Palace, London N22 7AY. Opening Times: are Friday 11am - 6pm, Saturday 10am – 6pm and Sunday 10am – 5pm.